President Donald Trump ran his campaign on the promise of a wall that would run the length of the U.S.-Mexico border. While Secretary of Homeland Security John Kelly still does not know what the wall will look like, he said it will probably not resemble the single concrete partition the president discussed. Kelly, who testified at the Senate Committee on Homeland Security and Government Affairs hearing April 5, said the border wall will probably be an amalgam of physical barriers and technological sensors, including drones and radar. He said that DHS will set up physical barriers at the points where border security chiefs deem walls most necessary. The U.S.-Mexico border is almost 2,000 miles long; Kelly stated that 650 miles already contain physical walls. Kelly said that both physical structures and technological devices help stem the flow of illegal immigrants and harmful substances, such as methamphetamine and cocaine. While Kelly said he will continue to correspond with border security chiefs, he stated it is unlikely their needs will manifest in the form of one continuous wall. He said “the wall” refers to everything from concrete to fences to drones. Sen. Claire McCaskill, D-Mo., agreed with Kelly, stating that Trump is the only person who does not realize a solid 2,000-mile wall is unlikely. How incomers will be received, in addition to what sort of boundaries they will traverse, was another point of concern at the Senate hearing. Part of the president’s “extreme vetting” plan involves scanning people’s social media accounts for suspicious content and probing their ideological beliefs. Searching people’s devices at ports of entry is not a novelty. According to Kelly, 1 million people come into the U.S. every day, and almost half of them are subject to device searches. Sen. Ron Johnson, R-Wis., stated that 23,877 devices were searched in 2016. Kelly said that, in the past, mobile searches have helped DHS identify pedophiles. 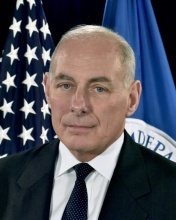 Kelly stated that the “vast majority of people” will not be subject to social media searches and ideological questions. However, McCaskill said these methods will not deter suspicious individuals, but will only show them how they may be searched. In addition to bolstering border security, Kelly said he is working to improve the agency’s cybersecurity posture. Last year, the Department of Defense hosted Hack the Pentagon, a crowdsourcing initiative challenging technical geniuses to uncover vulnerabilities in DoD’s public Web pages. Kelly said he wants to establish a similar program within DHS.